Probably the best concert in Zeppelin history. You will not hear Plant in better form post 1970. Page rises to the level of his bandmate by playing to a madness level. To me, Plant was in better shape vocally in all of the pre-U.S. tour shows in 1971 than in any 1972 show. If you want to hear him in exceptional voice, listen to 05/03/71 Copenhagen or 08/07/71 Montreux. He messed up his voice maybe in the Vancouver 1971 show (of which we sadly don't have a recording). By the first show in LA (08/22/71), he's hoarse and he pushes his voice way too far that night and damages it further. The rest of the tour, he struggles to hit the highest notes, and he starts avoiding them (e.g. SIBLY, end of Stairway, Black Dog). It's not really until the winter UK 71 tour that he's had a chance to thoroughly rest his voice. But... he gets sick like a dog on that tour (I've heard). That said, in 11/24/71 Manchester, he sings extremely well for that era-- almost back to a pre-U.S. 71 level. In early 1972, the very top of his range is still giving him problems, in general. That said, he does a pretty nice job in some of the later Aussie/NZ shows. I think his singing in Portland was good probably because he just did two nights in NYC, in which his voice was cracking left and right, and in which he couldn't sustain or hit most of the high notes. Who knows? Maybe some friends of his who saw the concerts made comments to him about it. Thus, he rested for a couple of days, slept well, and may have been out to prove himself. Also, LA 06/25/72 has some outstanding singing from him for this tour. Amsterdam shows some excellent range at times, but his voice cracks a bit too much for my liking. As for my favorite 1972 Plant show, LA 1972 takes the cake. His voice is clear and pristine and cracks very little. That was really his last hurrah as a singer in that style. Okay, I just got done listening to some of those shows again. While his voice is definitely a bit better in 11/24/71 Manchester than in Portland, his performance in the Aussie/NZ shows is (in my opinion) not quite as good as in Portland. (You can hear it especially on Dazed and Confused and WLL.) 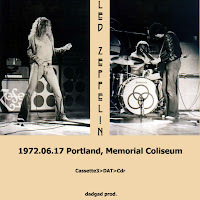 Now if you wanna compare Portland and 06/25/72 LA, I think you could argue either way, especially since the first part of the Portland show is missing.